Starting her day in Chapel Hill before sunrise, Jodi Flick drives to towns such as New Bern or Lumberton to do what she does best — translate research on mental health issues into applicable practice for the people of North Carolina. Bringing 35 years of direct experience as a mental health counselor and social worker in a variety of settings, Flick (photo right) wears multiple hats to serve the people of North Carolina. 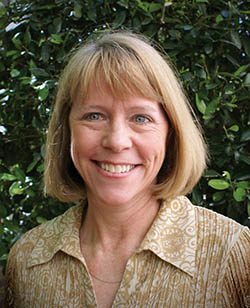 First of all, she is a clinical associate professor and education specialist with the UNC-Chapel Hill School of Social Work, working with the NC Division of Social Services to train child abuse and neglect investigators. In addition to her UNC role, Flick develops and presents AHEC continuing education workshops statewide on topics such as: client violence; suicide prevention, intervention and postvention; families and communities impacted by methamphetamine; and bipolar disorder and its impact on the family. Showing a true passion for her field, Flick was also a crisis counselor with the Chapel Hill Police Department Crisis Unit for 19 years. She provided counseling, victim assistance, and crisis intervention in traumas such as domestic violence, sexual assault, and family issues. Three years ago, she initiated a suicide support group that has served more than 200 people on a volunteer basis. How does she do all this? In the past year alone, she has trained 347 participants in AHEC courses in Cabarrus, Pitt, Guilford, Forsyth, New Hanover, and Robeson counties.